One of the world’s greatest super heroes is among us and Hong Kong will never be the same. 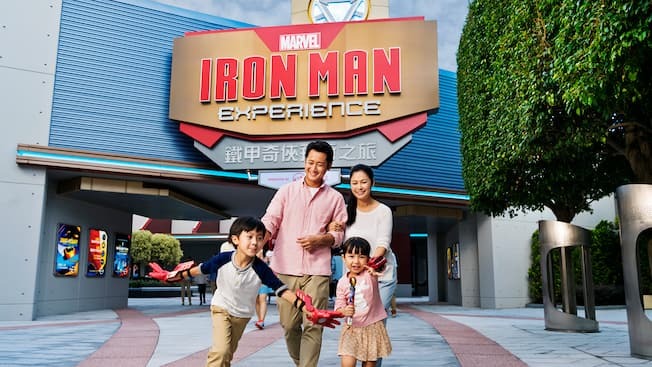 Iron Man Experience - the first ever Marvel themed ride to feature at a Disney theme park, now opens at Hong Kong Disneyland! Step into the amazing world of Stark Industries! The Stark Expo gives you an all-access look into the company’s legacy of changing the world for the better, before showing you the ground-breaking technology that will shape our future. See with your own eyes Stark innovations that will improve your home today and the visionary thinking that will transform your entire world tomorrow. The Stark Expo is divided into several exhibition halls. In the Hall of Protection, you can get up close to the iconic Iron Man MARK III suit and other leading advancements in the sphere of defense. Then get an inside look at how the arc reactor provides enough clean and sustainable energy to power an entire city in the Hall of Energy; followed by the Hall of Mobility, where you will see the latest technological masterpiece from Stark Industries - the gravity-defying Iron Wing. Pick up a pair of StarkVision glasses, and prepare to be launched into a whole new era! Each flying Expo Edition Iron Wing is powered by its own arc reactor and features all the latest Stark Industries technology – including heavy-duty armour plating, artificial intelligence and self -healing glass. Once you’re cleared for take-off, you’ll be taken on a thrilling aerial tour of the city to get a unique perspective of the latest and tallest addition to the Hong Kong Skyline – Hong Kong Stark Tower. Just a word of warning, there are reports of Hydra elements operating in the region. Be prepared for action!